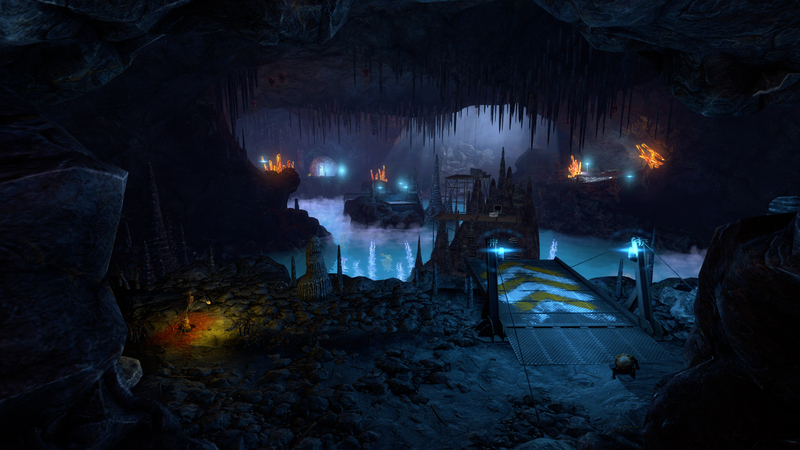 The Black Mesa [official site] gang have shared a first look at Xen in their Half-Life remake. You might remember that they launched Black Mesa without Half-Life’s oft-maligned final chapter, set in the alien world of Xen, because doing it right was taking yonks. You might further remember they’re planning to launch Xen in summer 2017. You might… well, I was surprised by this first peek at a Dear Esther-lookin’ cavern.You can see the full-size screenshot over here. It’s interesting! Valve’s own Xen had plenty of scientists scattered across Xen, showing the many deaths they met on their forays into the alien dimension, but this has them clearly a little more established and building a little. Neat-o. Dooo you suppose it’s what became of this cave, the one with the butterfly-powered teleporter, in Half-Life’s first level of Xen? Wild guess. My memories of Xen are a little hazy but that sprang to mind. I suppose I’d hoped it would be way more organic and meaty and weird. I liked the old pastel colours and swirly ice cream fudge sundae waters. This is only one single screenshot mind, so I’d be a fool to assume it’s all like this. Who’s a fool? Not me, says the name tag sewn into my underwear.